Content calendars are structured to help you achieve content success on a daily, weekly and monthly basis. 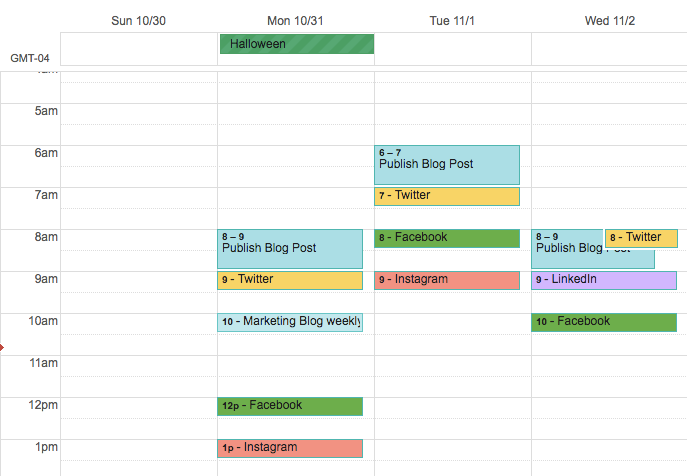 This schedule allows consistent engagement for your audience and followers on social media. Additional benefits include a multichannel approach to distribution, enhanced content due to planning, and measuring the strategy of promotion. Decide on the campaign, curated series, topic/theme, or message you want to deliver. Be sure that it is relevant and in line with your brand. Determine the duration - ex. one month or up to six months - followed by the frequency of social media postings - ex. daily, weekly or monthly postings. Do some research on the time of day to deploy content. After you have settled on the scope of content and established a timeline start writing content. To optimize social media metrics (SMO) pay attention to keywords. Searchers use keywords to locate more information (SEO). For example, if writing a blog post on "car industry trends 2017", try a Google search and see what information appears. Notice, keywords "auto" and "automotive" appear frequently and should be incorporated in the blog post. To see if your content is resonating with your audience and followers on social media look to see it's reach. Is the content being shared and liked? How is your website's organic traffic analytics? If the metrics are not aligning with your goals, reassess your content and adjust accordingly, including your timeline. Danico Enterprises can help, ask us how.